“In order to understand environmental change in the oceans we need to better understand what is preserved in the geological record in the seabed,” says lead researcher Dr Adriana Dutkiewicz from the University of Sydney. “This disconnect demonstrates that we understand the carbon source, but not the sink,” says co-author Professor Dietmar Muller from the University of Sydney. More research is needed to better understand this relationship. 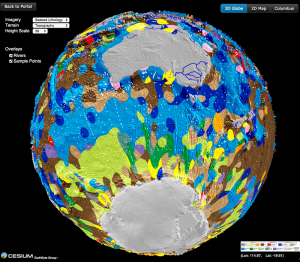 Dr Dutkiewicz and colleagues analysed and categorised around 15,000 seafloor samples – taken over half a century on research cruise ships to generate the data for the map. She teamed with the National ICT Australia (NICTA) big data experts to find the best way to use algorithms to turn this multitude of point observations into a continuous digital map. “Recent images of Pluto’s icy plains are spectacular, but the process of unveiling the hidden geological secrets of the abyssal plains of our own planet was equally full of surprises!” co-author Dr Simon O’Callaghan from NICTA said. The digital data and interactive map are freely available as open access resources.